Everyone Anton Waker grew up with is corrupt. His parents dealt in stolen goods, and he was a successful purveyor of forged documents until he abandoned it all in his early twenties, determined to live a normal life, complete with career, apartment, and a fiancée who knows nothing of his criminal beginnings. He’s on the verge of finally getting married when Aria—his cousin and former partner in crime—blackmails him into helping her with one last job. Anton considers the task a small price for future freedom. But as he sets off for an Italian honeymoon, it soon becomes clear that the ghosts of his past can't be left behind so easily, and that the task Aria requires will cost him more than he could ever imagine. Emily St. John Mandel was born in British Columbia, Canada. Her most recent novel, Station Eleven, was a finalist for the 2014 National Book Award and a New York Times bestseller. 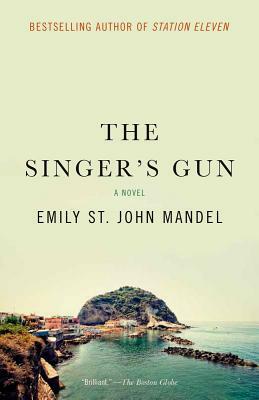 Her previous novels were Last Night in Montreal, The Singer’s Gun, and The Lola Quartet. She is a staff writer for The Millions, and her work has appeared in numerous anthologies, including The Best American Mystery Stories 2013and Venice Noir. She lives in New York City with her husband.